John Marston's Eldest son, Charles, was in charge at Villiers and rapidly expanded the highly profitable company. When faced with a claim for death duties, after has father's death, he sold John Marston Limited to a consortium of wartime munitions manufacturers who had done well out of the war and were looking for somewhere to invest their money. After John's death, Thomas Cureton, who was John's right-hand man became chairman. Sadly he soon died, and was replaced by Sidney Bowers. In 1919 the consortium was taken over, and became part of Nobel Industries Limited, and a return to civilian production was authorised by the Government. Richard Morris's 3.5 hp. Sunbeam from 1915. Sunbeam quickly produced a new catalogue, which listed what were basically models from the 1916 range, and new versions of the W.D. machines. The catalogue included the new 3½ hp. 'Sporting Model' which was nearly identical to the 'W.D. 3.5' and sold for 95 guineas. There was also a 3½ hp. 'Standard' model which sold for the same price. There was a new 8 hp. machine, that was basically the 8 hp. JAP powered W.D. machine. It sold for 115 guineas with a sidecar. The 'Number 1' sidecar now sold for £27 guineas and the 'Number 2' sidecar sold for 35 guineas. These prices soon increased due to the rapid inflation which followed the war. Prices continued to increase until 1921, when the 3½ hp. models sold for 171 guineas. The new models were well received by the general public. The press considered that they were amongst the most handsome machines on the road and the 3½ hp. single was described as the Rolls Royce of singles. 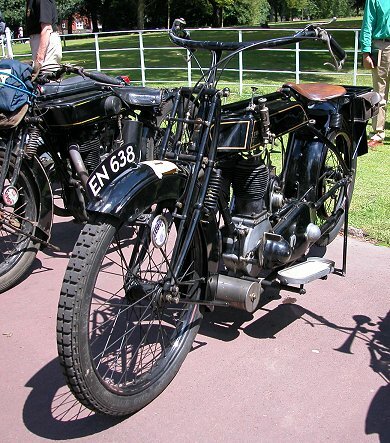 When motorcycle sporting events restarted in 1919, Sunbeam continued to have a high profile and be very successful. 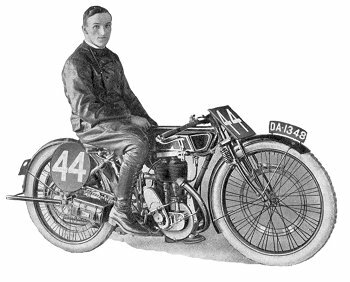 Competitions were dominated by Sunbeam riders such as George Dance, Tommy de la Hay and John Greenwood. 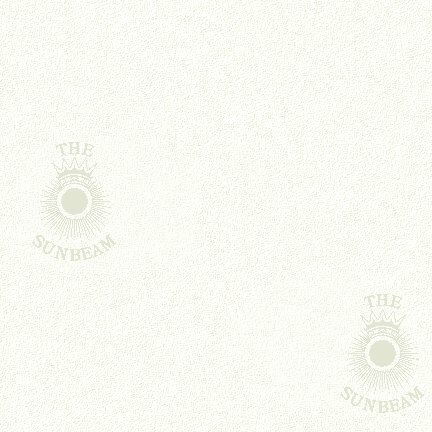 A new Sunbeam range was developed in readiness for 1920. The new machines included the famous laminated leaf spring front fork, which was to be an important feature of future Sunbeam machines. Larger cylinder cooling fins were introduced along with drum brakes on the 3½ hp. model. Another introduction was detachable and interchangeable wheels. 1920 was to be an important year for the Sunbeam competition team. The company achieved its first T.T. victory when Tommy de la Hay came first in the Senior Race at an average speed of 51.79 m.p.h. W.R. Brown came third on a similar machine and George Dance had the fastest lap at nearly 56 m.p.h. An advert from February 1920. An article from 'The Motor Cycle', 1st April, 1920. A machine which has always occupied a place in the very front rank is the Sunbeam. With the happiest memories 'of a Six Days Trials' experience in the Lake District on a 2¾ hp. model, it was with the greatest pleasure that the writer adopted Mr. A. S. Bowers' suggestion of an extended trial of the 1920 3½ hp. single-cylinder sporting model. By reason of its good name, one, of course, expects a great deal from a modern mount with the now familiar black and gold tank, but those expectations are fulfilled in their entirety -nay, more-on acquaintance with the machine. The 'T' section bottom bracket casting now employed. The front chain adjustment is effected by a draw bolt. First impressions are everything, they say. Our trials machine was handed over tuned to the last notch and equipped to the last word. Would that we could say the same of every machine placed at our disposal for trial! A dig at the kick-starter, and the willing engine promptly answered, the silky-acting clutch engaged, and away the machine went as smoothly as a good-class car. Gear changing proved easy, and, in short, one was at once inspired by the feeling that the machine was in perfect tune and condition, and ready for the most difficult test. There is a great deal of difference in the controllability of modern motor cycles. Some engines are docile and tick over quietly in the free position; others with smaller flywheels and less carefully designed cams will roar and vary in their actions when not running under load. Need we say that the Sunbeam belongs to the former category? It is by no means a lightweight, yet its controllability, due to its well-balanced engine and conveniently arranged controlling mechanism, contributes in no small measure to the contentment of the rider and feeling of long acquaintanceship with the machine, even though that acquaintance may have been but short. The latest 3½ hp. sporting model Sunbeam which has a laminated type spring fork. With semi T. T. bars and the new type laminated spring fork, one can imagine no more desirable type of mount for the man who desires to "get there" and back, and with the minimum loss of time. Hill climbing with this all chain-driven "3½" with its 85 x 88 m.m. (499 c.c.) side valve engine, is a sheer delight. Although provided with three separate ratios, the lower ones are seldom called into use for solo work, except, of course, when starting away from rest, and possibly in thick traffic, for all ordinary hills are quite within the compass of the top gear of 4.6 to 1 even with a rider of 11½ stone up. It is no compliment to a mount of the Sunbeam calibre to instance Sunrising Edge, and Sudeley Hills, since public trials have demonstrated that no hill with a rideable surface is too steep for such a mount. One's appreciation must therefore be devoted to its reliability, its cleanliness, its controllability, and its generally excellent design, leaving hill ability as a foregone conclusion. We have proved that the clutch will stand any amount of abuse. The handiness of the detachable wheels we have not had occasion to demonstrate with this latest 3½ hp., since the makers are wise enough to equip it with tyres well up to their work, and which, as an almost natural result, have, never punctured. A detail worthy of praise is the oil feed to the gear box, controllable by a two-way tap operated from the saddle, thus eliminating the need for periodic use of the usual separate, oil gun, which, to say the least, is a nuisance and a messy operation at best. The gears, incidentally, are extremely quiet in action, as well-cut gears usually are. The seat lug of the 3½ hp. Sunbeam has rear stays brazed-in. An expander bolt and cone secures the saddle-pillar. The power unit of the single-cylinder Sunbeam, which has a capacity of 499 c.c. Prolonged fast running in no way affects this remarkably efficient engine, and that the cooling is sufficient for all purposes is demonstrated by the ease with which single figure gradients are surmounted on the run. Indeed, as we have said, the Sunbeam owner can revel in hill work whether the roads are wet or dry, for in the event of wet, the rider can proceed in comfort so far as the machine is concerned, buoyed up with the knowledge that, whatever the elements, the transmission, running as it does in oil bath chain cases, is working under ideal conditions. The prolonged life of chains, due to their entire protection from outside elements, needs no emphasis. In our trials we have been impressed by the absence of valve clatter; separate timing wheels are employed for inlet and exhaust with their respective cams formed upon them, the cams operating the adjustable headed tappets through rockers. Once or twice in a rather tight corner, we have raised the left handlebar lever expecting to operate the valve lifter, forgetting for the moment that the control of the Sunbeam front brake is operated by the left-hand lever and the valve lifter on the right; but that, after all, is due to custom, and only confirms our opinion that motor cycle controls, should be standardised. The exterior and interior of the Sunbeam countershaft three-speed gearbox, a design in which the gears are always in mesh. The operating mechanism, as well as the kick starter, crank and its pinion, are plainly discernible. The brakes themselves are extremely effective and solidly arranged, nothing to get bent or disappear with vibration, the wide guards are a feature to admire, whilst throughout the design bears the mark of the master hand only to be expected when one realises that managers, designer, and testers alike are keen motorcyclists themselves, always out to improve, and having a high standard invariably in mind. In brief, our experience of the machine, extending over several weeks, has been entirely devoid of untoward incident, it has failed at nothing, started easily with wonderful consistency, not even a puncture has marred our enjoyment, and consequently one may justly dub the Sunbeam as a machine of unfailing reliability. The 1921 catalogue included three versions of the 3½ hp. model, the 'Standard', the 'Semi-Sporting', and the 'Sporting Solo Sunbeam T.T. Model'. Prices reached their highest ever. The 8 hp. 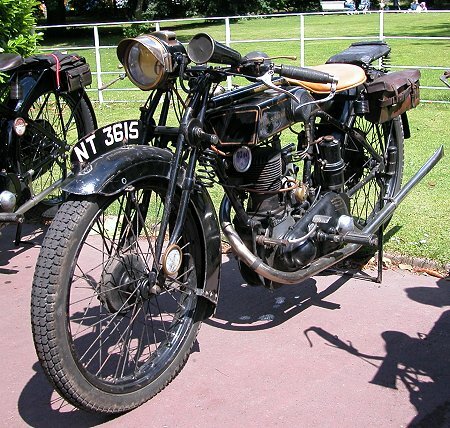 machine sold for 176 guineas and the 'Number 2' sidecar cost an extra 50 guineas. Prices soon began to fall however, as ex W.D. machines became available to the general public. This caused a lot of problems in the industry as many manufacturers now suffered from over production, because the motorcycle buying public were snapping up these ex W.D. bargains in preference to new models. The price of the 8 hp. machine soon fell to 160 guineas and the sidecar fell to 47 guineas. In 1921, George Dance made a series of superb runs at Brooklands. In the 350 c.c. class he set a new record at 82.25 m.p.h. in the Flying Kilometer, and achieved 82.19 m.p.h. in the Flying Mile. In the 500 c.c. class he achieved 93.99 m.p.h. in the Flying Kilometer, 87.35 m.p.h. in the Flying 5 Miles and 82.69 m.p.h. in the Standing 10 miles. Two new models were introduced in 1922. The 'Longstroke T.T.' 3½ hp. machine made its appearance , as did the 4¼ hp. Sunbeam, which was mainly sold with a sidecar. Sunbeam achieved its second T.T. win in the Senior Race when Alec Bennett came in first, at an average speed of 58.33 m.p.h. Back in Wolverhampton this caused big problems, because the win led to a disagreement between Alec Bennett and Tommy de la Hay. They each wanted to be regarded as the leading Sunbeam rider. Sidney Bowers intervened and chose Tommy, and so Alec Bennett left Sunbeam to work for Douglas. He didn't ride for Sunbeam again until 1929. An article from ‘The Motor Cycle’, 31st January, 1924. Newly designed frame, modified cylinder head, and mechanical lubrication form features of the o.h.v. machines. Much interest will centre around the latest products of the Sunbeam factory. Two new o.h.v. machines make their appearance, similar in engine design but of different capacities, i.e., 347 c.c. and 493 c.c. O.h.v. rocker details and cylinder head. In the first place, an entirely new frame has been evolved, giving a wheel base of 54 inches, which is of conventional appearance, having a sloping top rail. The front down tube ends in a tee piece just below the tank, from which two members are carried to the front engine plates. To facilitate the removal of the cylinder head the tube carrying the tank is made detachable, and a few moments only are required to effect its removal with the tank. A very careful piece of design, the engine, is fitted with two overhead valves operated by push-rods and rockers and inclined in the semi-spherical cylinder head at a steep angle. There are three springs to each valve, and the rockers, which are supplied with greasers, are equipped with return springs. The cylinder head itself is substantially constructed, special attention having been paid to the finning, especially around the exhaust port. Fitted at an angle at the left-hand side of the head, the sparking plug is in the direct path of air currents. The full skirted aluminium piston has three rings at the top, while the gudgeon pin is of the full floating type. In the larger engine the bore and stroke are 90 mm. x 98 mm. respectively, giving a capacity of 493 c.c. Lubrication is carried out by a mechanical pump which is of the double gear type. It is mounted on the outside of the timing gear cover. Neatness is one of its chief features, and its simplicity and the scarcity of its working parts, coupled with their positive operation, are assurances of its reliability. There is a sight feed on the tank. A roller bearing is provided in the big end of the connecting rod, the main shaft being supported on ball bearings. Gas is supplied through a two-lever Amac carburettor, and the spark is obtained from it special E.I.C. magneto. Mechanical oil pump on the new engines. By removing two bolts, the tank and top rail of the frame are quickly detached, thus facilitating access to the cylinder head. Transmission is by chain throughout, the front chain being totally enclosed in an oil bath case. On the larger machine the gears provided give ratios of 4.4 to 1, 6 to 1, and 8 to l. The wheels are shod with 26 in. x 2½ in. tyres, and internal-expanding brakes are fitted fore and aft. 493 c.c. machine in the new sloping top tube frame, available for both models. The lower powered machine has an exactly similar specification to the above, but the engine has a bore and stroke of 70 mm. x 90 mm. =347 c.c., and the gear ratios are 4.9 to 1, 6.3 to 1, and 9 to l. Another item of interest is that in both sizes the machines may be obtained with either the sloping top tube frame or the more usual Sunbeam design. 347 c.c. Sports Sunbeam with the new detachable tank rail frame. These extremely attractive machines are priced at £105, with the larger power unit, and £94.10s. with the smaller engine. In the 1920's sprint meetings were a very popular form of motorcycle sport. They were often held on a public road that had been closed especially for the event. George Dance made quite a name for himself in the post 1918 years, with sprint and hill climb machines that were based on standard 350 c.c. and 500 c.c. Sunbeams, with cut-down frames. He was virtually unbeatable, and as Development Engineer at the works, the famous 'Sprint' models were his creation. In 1925 the Government banned racing on public roads; the last meeting took place at Hereford on 4th April 1925. The 'Sprint models were discontinued, and in 1926 prices fell by about 5 guineas per model. The cheapest machine then sold for £72, and the top of the range 'Model 9' sold for £105. Bob Terry's Model 6 from 1927.